Born in Ginza, Tokyo in 1947 as a son of medical doctor. His grandfather was also a medical doctor of St. Luke’s International Hospital, a familiar place for Toshi from his youth. 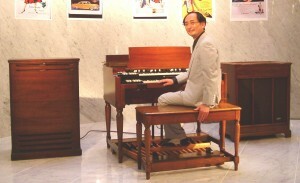 He has been playing in Japan and abroad in various occasions. He gave his play of the Hammond organ to record as scientific data in governmental institution. His great-grandfather was Yoshinoshin Kisu, who was a first Japanese student overseas studying at the Music Academy of Tsarist Russia and became one of the founding stones in modern music in Japan.